A big part of what Native Fish Coalition is trying to do is educate and inform the masses (not just anglers) as to what native fish are, where they are found, why they are important and why they should be protected. Informational signage is sorely lacking these days due to budgetary constraints and focus on other things such as habitat, stocking, law enforcement, etc. Most government agencies have cut way back on signage and non-profs will need to pick up the slack. Sea-run brook trout, or "salters" as they are called, are a fascinating native fish that we do not know nearly enough about. They move between freshwater and saltwater in search of food and thermal refuge. 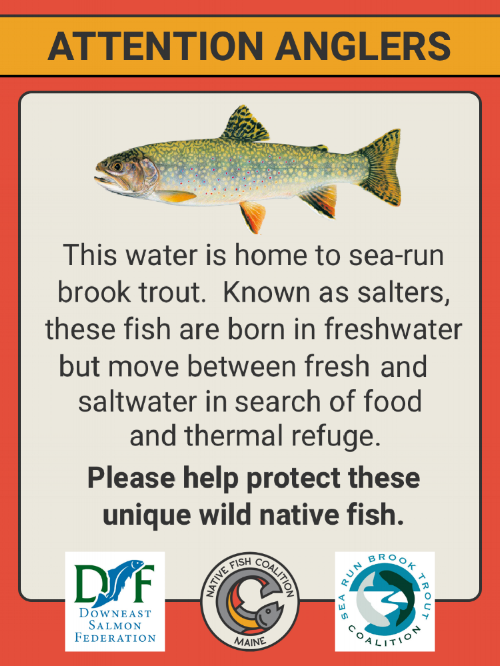 Partnering with Downeast Salmon Federation and Sea-Run Brook Trout Coalition, the Maine chapter of Native Fish Coalition developed an informational sign to be put up on rivers and streams in Downeast Maine. Yeti Steps Up for Maine's Rare Arctic Charr - Again!